Join Our Newsletter Today to Receive Great Tips on Keeping Your Pet Healthy! Tumors are common in cats, especially as they get older. This page describes how we treated an intestinal tumor in an 11 year old cat named Ruby. The format in this page will be different than our other disease pages. In this one we will present it as a case study, and show the diagnostic process that allowed us to make this diagnosis. We will follow the parameters of the diagnostic process in this case, the same process we use in every diagnosis me make. If you are not familiar with this process click here for a quick review, then come back to this page and continue the case study. You need to have an understanding of the diagnostic process in order to appreciate the thought process involved in making Ruby's diagnosis. This page will show an actual surgery at the end where we remove a segment of intestine. It might not be suitable for young viewers. 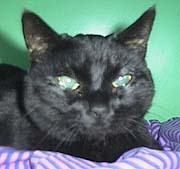 Our patient is an 11 year old spayed female domestic short haired cat named Ruby. Domestic short haired cats have no breed predilection, so this information does not narrow down the list of possible diseases at this point. 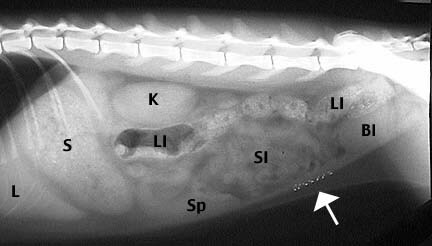 Since Ruby is spayed there is negligible chance of a reproductive problem like pregnancy or an infected uterus, called a pyometra. Ruby has been lethargic and not eating for 2 days. She seems painful when picked up and has been vomiting a yellow fluid. Other important parameters like bowel movements, breathing, and urination are normal. This information is helpful because now we start getting a feel for the extent of Ruby's problem. It is unusual in that she is vomiting and has not eaten in 2 days, yet her bowel movements and urination are normal. A pet that has these symptoms is almost always dehydrated and would not be having normal bowel movements and urination. This discrepancy in the history is not uncommon in many cases. Because of the new information we obtained in Ruby's history, we need to add infection, intestinal foreign body, abscess, liver disease, FeLV, FIV, FIP, kidney disease, hyperthyroidism, and even poisoning to her potential disease list. Our exam findings give us important information. Ruby has a fever (normal cats are usually less than 103 degrees F). She is dehydrated, as was expected from her history. We make a determination of her state of hydration by looking at the color of her gums, checking if her eyes appear sunken, and noting how elastic her skin is when we pull it up and let it go. The fact that she has a mass in her abdomen is one of our most important findings so far. This is one of the most important parts of our diagnostic process. It is a list of the most likely diseases that are causing Ruby's problem. Based on this list we will perform specific diagnostic tests to narrow the list down to the most likely disease processes occurring. We will also institute treatment based on her problem list and the differential diagnosis. We always initiate symptomatic treatment before our test reports return. This decreases our patients' discomfort as soon as possible, and allows us to treat the problem earlier which is always an advantage in healing. Intussusception- A disease where the intestines literally telescope into each other. This obstructs the flow of food through the intestines, and can lead to death of a section of the intestine. By running diagnostic tests we rule in or rule out the diseases in our differential diagnosis list above. In Ruby's case we initially ran a blood panel and took an x-ray. The blood panel revealed an elevation in her white blood cells. Tests of the liver, kidney, pancreas, red blood cells, protein, and viruses were all normal. A radiograph was taken of Ruby's abdomen. The stomach, kidneys, large intestines, and bladder all appeared normal. The liver was slightly enlarged (called hepatomegaly). There was a large soft tissue mass effect in the center of the abdomen. Here is Ruby's radiograph. The large white section in the lower center is the problem area. This is where the small intestines (SI) are in the above radiograph. Can you see the liver, stomach, and kidneys? 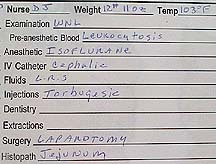 A tiny needle was inserted into the mass in her abdomen and some cells were removed for analysis by a pathologist. This test is called an aspirate, and the analysis of these cells is called cytology. The normal blood panel, except for the elevated white blood cell count, minimizes the chance of liver, kidney, and feline viral diseases. The x-ray eliminates constipation as a cause to Ruby's problems. The report from the cells taken from the abdomen indicates there is infected or dying tissue in the abdomen. This is a serious finding and necessitates immediate action. No anesthesia is required and Ruby does not have to undergo the trauma of surgery in her abdomen. Ultrasound is very accurate, the results of the ultrasound are immediate, and biopsies can be obtained accurately. With the ultrasound an expert can literally visualize the internal structures of an organ and make a determination on whether or not it looks healthy. 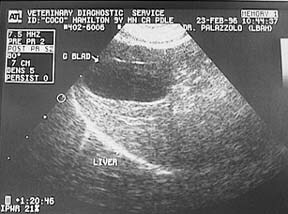 Here is a typical ultrasound picture on a different case. It is looking at the liver and gall bladder. By looking at the liver closely an experienced doctor can determine if the cells in the liver are abnormal. If they are abnormal the ultrasound is used to guide a special biopsy needle right to the problem area. Our ultrasound doctor is giving us a demonstration of how the biopsy is obtained. Only a small amount of tissue is obtained with this method. When analyzed microscopically by a pathologist a significant amount of information can be obtained. Surgery might be inevitable, so why delay. No treatment can be given with ultrasound, it is for diagnostic purposes only. Delaying prolongs the time it takes to ultimately correct Ruby's problem and adds additional costs to the bill if we do proceed with a laparotomy. An exploratory surgery in Ruby's abdomen is called a laparotomy. It has the advantage of giving us an immediate diagnosis and gives us an opportunity to treat the condition (if the problem is not too far gone). Also, the surgeon can literally see the internal organs in their natural color instead of grey images on an ultrasound screen. It is a an invasive procedure that has risks, including the anesthetic risk. Even though the surgeon can palpate internal organs, he can not look at their internal architecture like the ultrasound does. Also, there is post operative discomfort and convalescence when a surgery is performed. With modern anesthetics and pain medication we can do almost any surgery in an older pet and not have any problems. In Ruby's case a decision was made to perform a laparotomy. We were fairly certain of our diagnosis and the need for surgery, so why prolong the inevitable. Our nurses noted that she had vomited during the night and she was scheduled for a laparotomy surgery sometime today. Her treatment consisted of lactated ringers solution. She was given 250 milliliters intravenously every 12 hours. Baytril, her antibiotic, was given at 1.3 milliliters intravenously every 12 hours. The following area contains graphic pictures of an actual surgical procedure performed at the hospital. Ruby was anesthetized and brought into surgery when she was anesthetically stable. A 7 inch incision was made in her abdomen and her internal organs were assessed. We suspected Ruby's problem was with her intestines, so we immediately assessed them. The diseased area was found and brought out through the incision in her abdomen. Not only were the small intestines swollen and discolored, there was a ruptured area of infection and dead tissue. 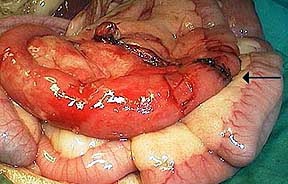 The oval mass in the picture below is a tumor in the small intestines. 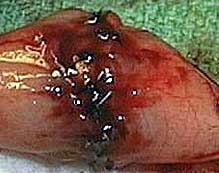 There is an opening in the center where it is dead and has ruptured into the abdomen. This section had to be removed without damaging the rest of the intestines. This is a delicate procedure because the intestines have a tremendous blood supply that can easily be injured during surgery. Special clamps (seen in the picture above) are used to separate the diseased tissue from the normal intestines. Once they are in place the blood supply to the diseased part of the intestine is cut off. 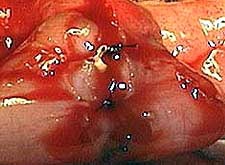 In this picture the larger black arrow on the top points to the diseased intestine, while the smaller 4 arrows in the center point to metal clips that have cut off the blood supply to the disease intestine. After cutting its blood supply the diseased tissue is removed by cutting between the 2 clamps. The clamp on the right (arrow) is on the diseased portion of the small intestine. 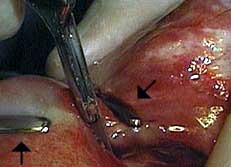 The clamp on the left (arrow) is a very gentle clamp that keeps any intestinal fluid from spilling out of the cut end of the normal intestine. We are using the scalpel blade to make the actual cut between the 2 hemostats. 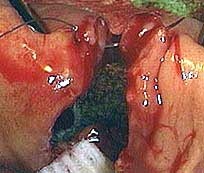 The opening of one end of the normal intestines is now visible towards the right immediately after it has been cut. 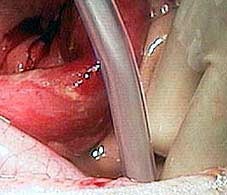 The center of this opening is lined with pink tissue called the mucosa, the white area around it is called the submucosa. The submucosa is thicker than normal, indicating that there might be additional disease in this section and further intestine might need to be removed. The tedious process of suturing the cut ends of the intestines (called an anastamosis) begins. These sutures are critical if there is to be healing and to prevent leakage of intestinal contents into the abdomen when this pet eats. The first suture is shown being placed as the process is begun. Part way through the suturing you can see the intestines coming together nicely. The bleeding is a good sign because it is a general indication of healthy small intestine. When all of the sutures are placed a small amount of sterile saline solution is injected into the anastamosis site to check for leakage. This is a good overall view of the anastamosted section of intestine (see arrow). You can see how this section of small intestine is more inflamed than the normal section below it. With the intestinal problem corrected we explore the rest of the abdomen for any other problems. Nature works in complex ways, and just because we found a problem in one area does not mean all the other abdominal organs (including more intestine) are disease free. This picture shows a normal spleen in the top left along with normal intestines on the bottom. The diseased tissue had ruptured which means there is an infection in the abdomen (this is called peritonitis). To alleviate this infection we flush the abdomen with copious amounts of warm saline solution. This picture shows our suction apparatus removing some of the fluid that was flushed into the abdomen. Here is Ruby just after surgery. She is a little groggy from the ordeal, but her pain medication has been administered so she is comfortable. She will be monitored closely and given some broth 12 hours after surgery. Within 24 hours after surgery she will be nibbling soft food. Her nurse was Denise Johnson and weight just prior to surgery was 12# 11 0z. The preansethetic examination by one of our doctors was within normal limits (WNL). Ruby's preansethetic blood panel showed an increase in her white blood cells called leukocytosis. She was given isoflurane anesthetic during the procedure. Lactated ringers solution was administered during the surgery through an intravenous catheter in her cephalic vein. 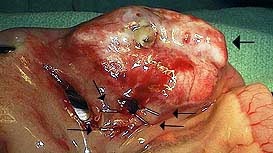 Immediately after surgery she was given an injection of torbugesic for pain. The surgery performed was called a laparotomy and the section of her intestine called the jejunum was submitted for histopathology by our pathologist. Ruby had a tumor in her small intestine called a Mast Cell Tumor. 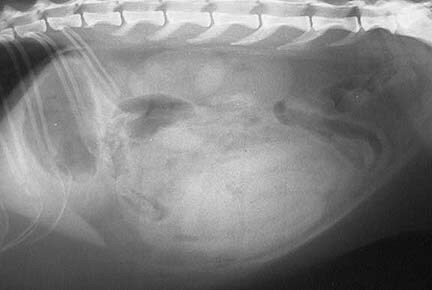 Compared to most abdominal tumors we diagnose it is a relatively rare form of tumor, and it is seen only in the cat. There is the possibility that it might spread to intestinal lymph nodes or even liver later in its course. It is difficult to say what will happen in the long term, so her prognosis is guarded. In addition to the surgery we put Ruby on medication to minimize side effects from the tumor. Mast cell tumors have the potential to release a compound called histamine. This can cause a type of allergic reaction and even cause ulcers in the stomach lining. Ruby is on medication to counteract this problem. Ruby returned to have her stitches removed 2 weeks after the surgery. Our online store can provide you with pet products and prescriptions that are competetive with any online organization, along with the added convenience of pre-approval by our doctors and products that are safe and effective, backed by the manufacturer's guarantee. © 1998-2012 CP LTD. all rights reserved.